Always in a rush? This helpful doormat reminds you to grab the essentials. Wouldn't it be awesome if a personal assistant handed you your essentials on your way out the door? This clever doormat does just that, and wipes your shoes clean. Crafted from coconut fiber, the sturdy, weather-resistant design reminds you to grab your wallet, keys, and phone. 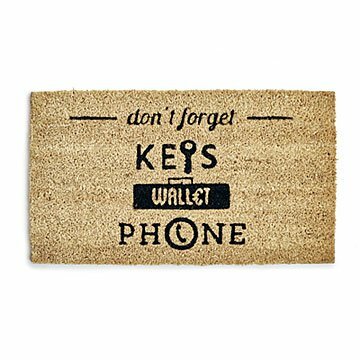 Give the secret weapon to a new home owner or that friend who's always forgetting things. Hand loomed in India.